International relations and geopolitics are not synonymous. “International relations” is a descriptive phrase that encompasses all the ways countries behave toward one another. “Geopolitics” is the supposition that all international relationships are based on the interaction between geography and power. We take this a step further and assert that a deep understanding of geography and power enables you to do two things. First, it helps you comprehend the forces that will shape international politics and how they will do so. Second, it allows you to identify what is important and what isn’t. This makes maps an extremely important part of our work. Writing can be an ideal medium for explaining power, but even the best writer is limited by language when it comes to describing geography. So this week, we have decided to showcase some of the best maps our graphics team (TJ Lensing and Jay Dowd) made in 2016… not just because these four maps are cool (though they are), but because we think they go a long way in explaining the foundations of what will be the most important geopolitical developments of 2017. This map illustrates three key aspects of Russia that are crucial to understanding the country in 2017. First is the oft-overlooked fact that Russia is a federation. Russia has a strong national culture, but it is also an incredibly diverse political entity that requires a strong central government. Unlike most maps of Russia, this one divides the country by its constitutive regions. There are 85 of these regions… 87 if you count Crimea and Sevastopol. Not all have the same status—some are regions, while others are autonomous regions, cities, and republics. The second aspect is that there is a great deal of economic diversity in this vast Russian Federation. The map shows this by identifying regional budget surpluses and deficits throughout the country. Two regions have such large surpluses that they break the scale: the City of Moscow and Sakhalin. Fifty-two regions (or 60% of Russia’s regional budgets) are in the red. The Central District, which includes Moscow, makes up more than 20% of Russia’s GDP, while Sakhalin and a few other regions that are blessed with surpluses produce Russia’s oil. The third aspect follows from combining the logical conclusions of the first two observations. Russia is vast, and much of the country is in a difficult economic situation. Even if oil stays around $55 a barrel for all of 2017, that won’t be high enough to solve the problems of the many struggling parts of the country. Russian President Vladimir Putin rules as an authoritarian. This is, in part, because he governs an unwieldy country. He needs all the power he can get to redistribute wealth so that the countryside isn’t driven to revolt. Maps that shift perspective can be disorienting, but they are meant to be. Our minds get so used to seeing the world in one way that a different view can feel alien. But that is even more reason to push through the discomfort. The map above attempts to do that by looking at the Pacific from Beijing’s perspective. China’s moves in the South China Sea have received a great deal of attention. In a Jan. 12 confirmation hearing with Congress, US Secretary of Defense James Mattis identified Chinese aggressiveness as one of the major reasons he believes the world order is under its biggest assault since World War II. But we believe the Chinese threat is overstated. This map helps explain why. The second obstacle is that China is surrounded by American allies. Some such as Japan (and to a lesser extent South Korea and Taiwan) have significant military forces to defend themselves from Chinese encroachment. Taiwan sticks out as a major spur aimed squarely at China’s southeast coast. Those that don’t have sufficient military defenses, like the Philippines, have firm US security guarantees. 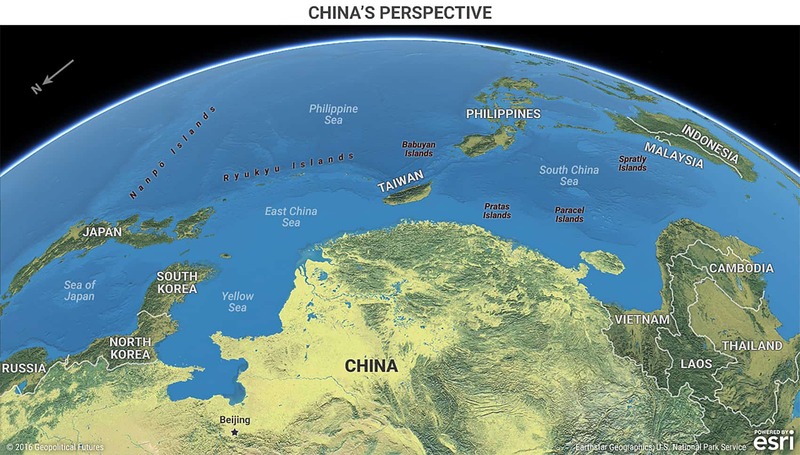 China is currently at a serious geographic disadvantage in the waters off its coast. This map, though, does not reveal a critical third piece of this puzzle—the US Navy outclasses the Chinese navy in almost every regard, despite impressive and continuing Chinese efforts to increase capabilities. But looking at this map, you can see why China wants to make noise in its coastal waters and how China is limited by an arc of American allies. You can also see why one of China’s major goals will be to attempt to entice any American allies to switch sides. Consequently, China’s moves regarding the Philippines require close observation in 2017. It has become cliché to point out that the Middle East’s current political borders were drawn after World War I by colonial powers like the United Kingdom and France, and that the region’s wars and insurrections in recent years are making these artificial boundaries obsolete. What isn’t cliché is doubling down on that analysis. We’ve drawn a new map of the Middle East based on who controls what territory, as opposed to the official boundaries recognized by international organizations like the United Nations. 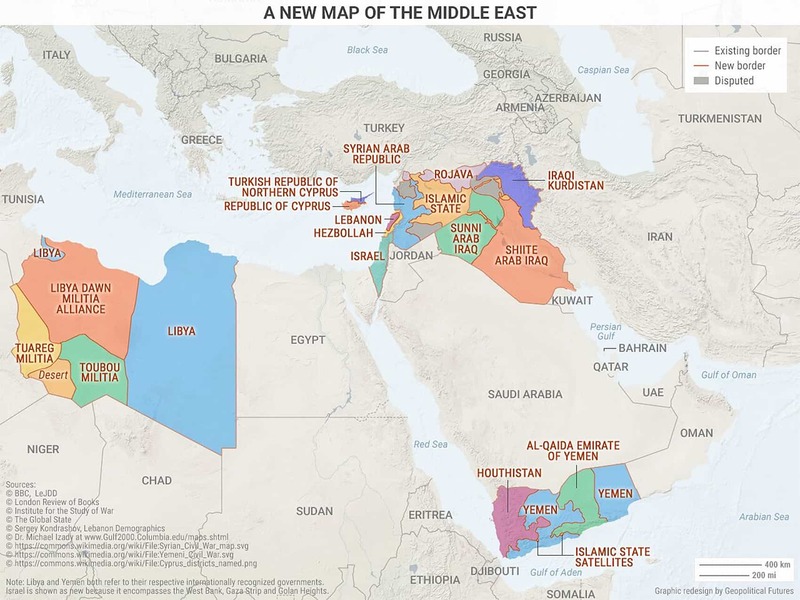 The map above reveals what the Middle East really looks like right now. Many will object to some of the boundaries for political purposes, but this map is explicitly not trying to make a political statement. Rather, it is an attempt to show who holds power over what geography in the Middle East. From this point of view, Syria, Iraq, Yemen, and Libya don’t exist anymore. In their places are smaller warring statelets based on ethnic, national, and sectarian identities. Other borders (like those of Lebanon and Israel) are also redrawn to reflect actual power dynamics. Here, a politically incorrect but accurate map is more useful than an inaccurate but politically correct one. Analyzing this map must begin with a disclaimer: This is, first and foremost, an analytical tool and a means of thinking about Europe’s future. It is explicitly not a prediction of what Europe’s borders will look like in the future. 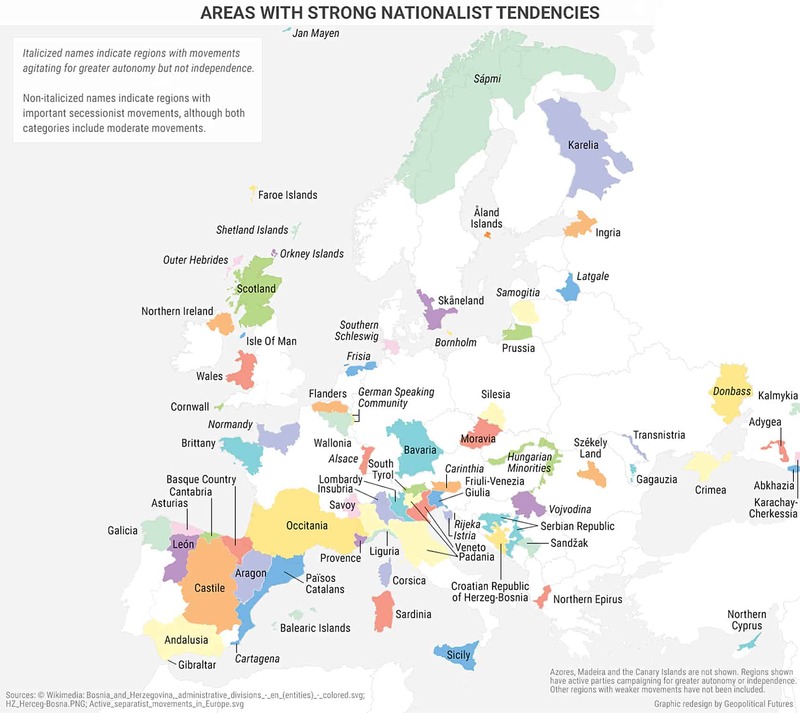 The map identifies areas in Europe with strong nationalist tendencies. Those regions with active separatist movements are not italicized. The italicized regions are those demanding increased autonomy but not independence. In many of these regions, secessionist movements may be favored by a minority of the population. The point here is not their size, but rather that in all these regions, there is some degree of national consciousness that is dissonant with the current boundaries of Europe’s nation-states. Brexit shook the foundations of the EU in 2016. Elections in France and Germany and domestic instability in Italy will shake those foundations in 2017. But Brexit also opened the doors to a deeper question: How will national self-determination be defined in the 21st century? Not all of Europe’s nation-states are on stable ground. The most important consequences of Brexit may end up being its impact on the political future of the United Kingdom. And in Spain, Catalonia already claims it will hold an independence referendum this year. Brussels, meanwhile, keeps trying to speak with one voice. This map communicates just how hard that is… not just for the EU, but also for some of Europe’s nation-states. The saying goes that a picture is worth a thousand words. Maps are worth many more. Our perspective on the world is rooted in an objective and unbiased approach to examining geography and power. Maps like these are foundational components for building that perspective. These four maps are especially helpful in thinking about the geopolitical forces that will shape the world in the year ahead. — The Geopolitics of 2017 in Four Maps originally appeared at Mauldin Economics.